If you have always torn open the envelopes of those pesky monthly bills, why not use a pewter letter opener instead? A letter opener (also called paper knife) lets you slit open an envelope neatly. There's no need to tear it up as if you really mean to destroy it. Besides, some envelopes are made of pretty tough paper that's not easy to tear by hand. Letter openers come in various shapes and can be made of plastic, wood, and metal (such as pewter). But they all have something in common, and that is they have blades for slitting envelopes. The blades are never as sharp as knives, for obvious reasons. But having said that, they are still sharp enough to be weapons. 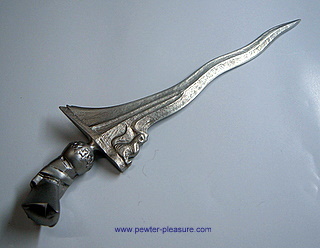 The pewter letter opener I have is a miniature of a real weapon. It's a keris (also spelt as kris), or Malay dagger. Of course, it's not as sharp or deadly as a real one, and it's much smaller. This one measures about 16.5 cm from the tip of the blade to the end of the handle. The keris is a dagger native to the Malay Archipelago in South-East Asia. It can be found in Malaysia, Indonesia, southern Thailand and also southern Philippines. Apart from being a weapon, it is widely believed to possess spiritual and magical powers, capable of bringing luck or disaster to its owner. Although the keris you normally see in pictures has a snakelike blade, straight blades are pretty common too. The double-edged blade gets broader from the tip to the hilt. The absence of a proper guard at the base of the blade means that the wielder's hand is not well protected from an opponent's weapon. The keris today is largely ceremonial, and is mostly used by some Malay groups or political parties as a symbol of pride and nationalism. By the way, don't be surprised if your pewter letter opener gets blunted pretty quickly. Pewter will gradually become dull from regular friction against other surfaces, even paper. And because it's a softer metal than, say, stainless steel, this process is therefore faster. There are other pewter deskware in this website, which you can check out below.